The illustrated DMT Knife Sharpener is the 6" Coarse-Extra Coarse Double Sided Dia-Sharp Knife Sharpener that features two flat continuous monocrystalline diamond surfaces that won't groove or hollow out. Use the Coarse 45 Micron, 325 Mesh side to restore an edge on a neglected tool or blade. Use the Extra Coarse 60 Micron, 220 Mesh side when significant removal of material is needed for damaged tools or blades. Both the Coarse and Extra Coarse sides are excellent for waterstone flattening. The 6" Double Sided Dia-Sharp Knife Sharpener with Coarse-Extra Coarse grit measures 6" long by 2" wide. 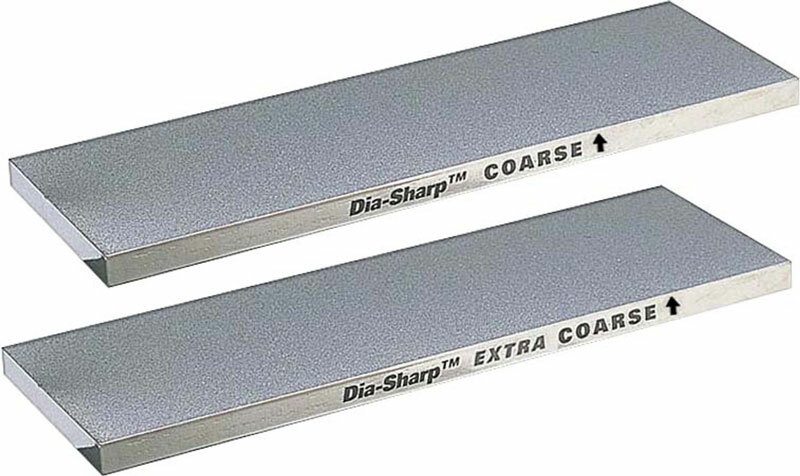 The DMT Dia-Sharp diamond sharpening stones feature a flat continuous monocrystalline diamond surface that won't groove or hollow out. Dia-Sharp stones quickly cut even the toughest steel. Use dry or with water; no oil is needed. Please note: this is a single stone with two sharpening sides.